Weather Data from Springfield, IL. 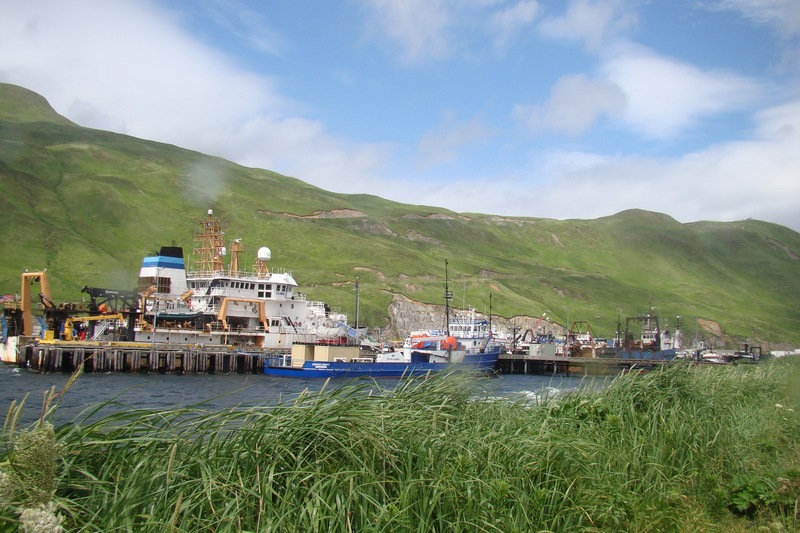 Dutch Harbor, AK is one of the main shipping ports in the United States. It is part of the town of Unalaska, AK and located in the middle of the string of Aleutian Islands. It is a 2 hour flight from Anchorage, AK. It is a rugged and desolate location in some respects. Everything must be flown in. Prior to boarding the plane for Dutch Harbor, each of the passengers had to be weighed with their carry on baggage. Twenty four of our bags could not be taken on our flight. Once we arrived at Dutch Harbor, we assumed our bags would be on the next cargo flight. On that flight, they carried mail so our bags were not able to be brought to us for another day. Even then there were no promises that our bags would arrive before we set sail. Luckily, they did. When it was determined that our ship had to return to Dutch Harbor for needed repairs, I held out hope that a quick fix would allow us to return to sea in a matter of days. But, things do not work that way in Dutch Harbor. It will be another week before the necessary specialists can be flown to Dutch Harbor. It will take several days to assess the needed repairs. Then, equipment and supplies will need to be ordered and flown in. Needless to say this is not going to be a quick fix. The Acting NOAA Corps CO called a meeting of all hands (all the personnel on the ship) to let us know that it would not be possible to finish this leg of the cruise. The Scientists and Teachers at Sea would be making plans to return home. Although I am disappointed that my time aboard NOAA Ship Oscar Dyson was cut short, I am grateful for the opportunity to participate in this Teacher at Sea experience. 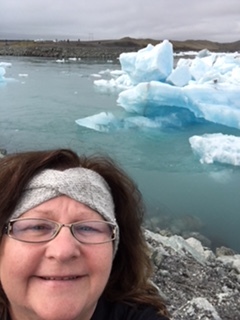 I learned so much about the Bering Sea ecosystem, fisheries management, life at sea, the mission of NOAA, the mission of the NOAA Corps, and the mission of the Teacher at Sea program. I loved being at sea! It was a great adventure for me. But what was an adventure and learning experience for me is a career for the people who work aboard this vessel. I was struck by their dedication and professionalism. I got to know the Scientists, the NOAA Corps officers, the Chief Boatswain, the Deck Crew, the Chief Steward, the Observers, the Survey Techs, the Acoustics Engineer, the Electronics Technician, and the Engineers. Everyone was passionate about what they do and it comes at a great sacrifice for them. Being at sea for weeks or months at a time means that they leave family, friends and duties at home, in order to do this work. They miss get togethers with family and friends, their children’s activities, birthdays, holidays etc. I have the utmost respect for them and the work they do. In leaving so quickly, I was not able to let them know in person how much I admire and appreciate them. They serve as stewards of our oceans and atmosphere and I am grateful for all they do. NOAA Corps officers serve on the sea, on land, and in the air to support NOAA’s environmental science and stewardship mission. They are one of two unarmed branches of the United States Services. Public Health Service is the other. Trawl hauls are how fishing is conducted. A large net is dropped into the water for a specific amount of time. By catching exactly what is in the ocean, the acoustic backscatter can be identified (what the various colored pixels on the echograms represent). Below is an echogram on the screen, the black line is the path of the trawl through the backscatter, the little red circle indicated where the camera was, and the picture at left is pollock passing by the camera and into the back of the net at that point. Screenshot of an echogram. The black line is the path of the trawl through the backscatter, the little red circle indicates where the camera was, and the picture at left is pollock passing by the camera and into the back of the net at that point. To get the backscatter from one fish for the above calculation, we need to know the size and species of the fishes. The trawl provides that information. In the fish lab, species including pollock are identified, lengths are taken, and the number of fish at each length is entered in the computer. Also, the animals including pollock are weighed and a mean weight is determined. The number of fish computed from the acoustic and trawl data multiplied by the mean weight of a fish equals the biomass of the fish (total weight of the population in a given area). The fisheries biologists developed the software used for all these calculations. This information coupled with the echograms can answer those earlier questions…Where are the pollock in the Bering Sea? How many are there? How big are they? How many adult pollock are there (fish that can be caught) and how many young pollock are present (providing information about future availability and how healthy the population is)? When I first boarded the ship, I asked the fisheries biologists how they would describe what they do. They responded that they count fish, it’s not rocket science. But you know what? It kind of is! This information is used to manage the Pollock fishery. Numerical data is given to the entities that set the fishing quotas for the Bering Sea area. Quotas are then divided up between the commercial and individual fishing companies/boats. Once fishermen reach these quotas they must stop fishing. This protects the fishery to ensure that this food source will be healthy and strong for years to come. A similar example from my home state is that of the Illinois is the Department of Conservation. One of their responsibilities is to manage the deer population. Then they can determine how many deer can be harvested each season that still allows for the deer population to thrive. In my last blog post, I talked about preparing for and “weathering the storm”. As with most things at sea and on land, things don’t always turn out as we plan. The stormy weather began with wave heights between 8-10 feet. The ship continually rocked back and forth making walking and everything else difficult. You can tell the experienced sailors because they were much more graceful than I was. I held on to every railing and bolted down piece of furniture that I could. And even then, I would forget and place a pen on the table, which immediately rolled off. While eating I held onto my glass and silverware because as I ate and placed my knife on my plate it rolled off. Dressing was a balancing act, which I was not good at. I finally figured out it was better if I sat in a chair. Luckily for me, my patch for seasickness worked. While I was sitting in the mess hall (dining room) an alarm rang. The engineers got up read the screen and left. The decision was made by the acting CO (Commanding Officer) that we would have to go back to Dutch Harbor. And now, as I write this, we are docked in Dutch Harbor waiting for word about the status of our voyage. Out here in Dutch Harbor, everything must be shipped in. We wait until parts and people are flown in. The fisheries biologists also have to determine the validity of the data collected on such a short voyage. They also must decide in a timely matter, can this data collection continue after returning to port? What kinds of fish live in the Bering Sea? How many pollock are in the Bering Sea? Where are the pollock in the Bering Sea? How big are the pollock in the Bering Sea? Those are just a few of the questions that the fisheries biologists on NOAA Ship Oscar Dyson work to answer during each voyage. 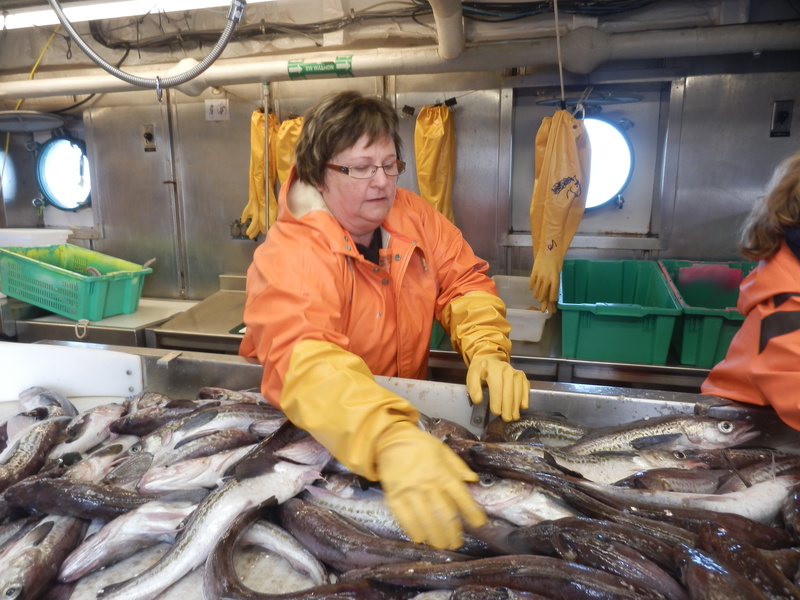 In my last blog, I talked about the need to manage the pollock fishery in order to protect this important ocean resource because it provides food for people all over the world. It is important, then, to be able to answer the above questions, in order to make sure that this food source is available each year. How do they do it? 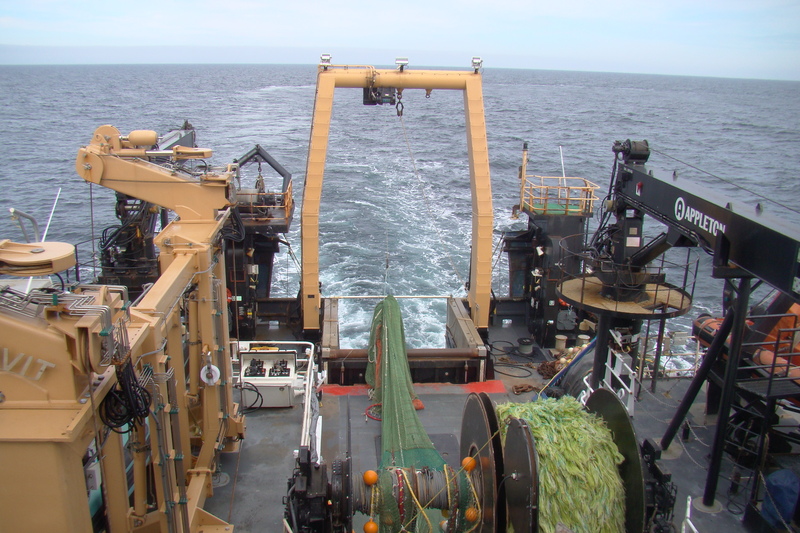 There are two main sources of information used in the Acoustics-Trawl (or Echo Integration Trawl) survey to determine the abundance and distribution of pollock in a targeted area of the Bering Sea. One is acoustics data, and the other is biological-trawl data. 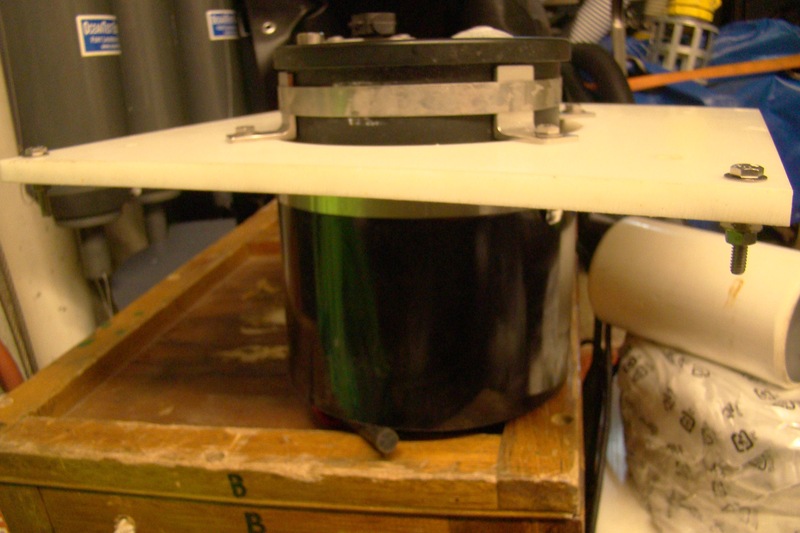 Acoustic data is continuously collected along a series of parallel transects with a Simrad EK60 scientific echo integration system incorporating five centerboard-mounted transducers (18-, 38-, 70-, 120-, and 200- kHz). In other words: There are 5 sound wave producers (transducers) attached to the bottom of the ship, each one emitting sound waves at different frequencies. This allows scientists to look at different organisms in the water column. Different types of organisms reflect different amounts of energy at different frequencies. The amount of acoustic energy reflected by an individual animal is called the target strength, and is related to the size and anatomy of the species. For example, a fish with a swimbladder (like pollock) reflects more energy than a fish without a swimbladder because its properties are very different from the surrounding water. Some ocean dwelling organisms don’t have swim bladders. Flatfish stay on the bottom so they don’t need the buoyancy. Floating organisms like jellyfish don’t have them. These organisms will look differently than pollock on an echogram because they have a smaller target strength. Transducers convert mechanical waves (sound waves) into an electrical signal and vice versa (like both a loudspeaker and a microphone combined). They contain piezoelectric materials sensitive to electricity and pressure: if a voltage is applied to them, they make a pressure or sound wave (transmit), and when a sound wave passes over them, it produces a voltage (receive). When a sound wave (echo from a fish) is received, electoral signal is sent to a computer, which displays the signals as pixels of varying colors as the ship moves along (depth changes up and down on the left of the image, and time and location changes along the bottom of the image). This datum is used to estimate the number and type of fish in the water column, and to determine where the ship should fish next. The size and colors on the images (called echograms) represent the backscatter at different depths and is related to the density of fish and their target strength. But, since they are dots on a screen, specific identification is not possible. The scientists assume certain strong signals are pollock based on the information they have but, those dots could be other fish. To determine what kind of fish are in the water column at this location, how many are there, and how big they are, other data must be obtained. Biological Trawl Data provides that additional information. More about that in my next blog post……I bet you can’t wait! So far my trip has been smooth sailing, literally. As NOAA Ship Oscar Dyson sails across the Bering Sea there is a bit of rocking the ship experiences at all times. This is easy enough for one to get used to and sometimes it even becomes comforting, like being rocked to sleep as a child. You adjust to the motion. Over the past couple of days I have been hearing talk of a storm coming our way. On a ship, there are many preparations that occur in order to get ready for a storm. Many items are always secured, such as shelves that have a wall in front so that things don’t fall off. There are “handle bars” in showers and next to toilets (think about that). Along hallways and stairways there are handrails on each side. Mini refrigerators in staterooms are bolted to walls. In fact most things are bolted to walls or stored in containers that are bolted to the wall. In the mess hall (dining room) condiments on tables are in a box so they can’t slide off. 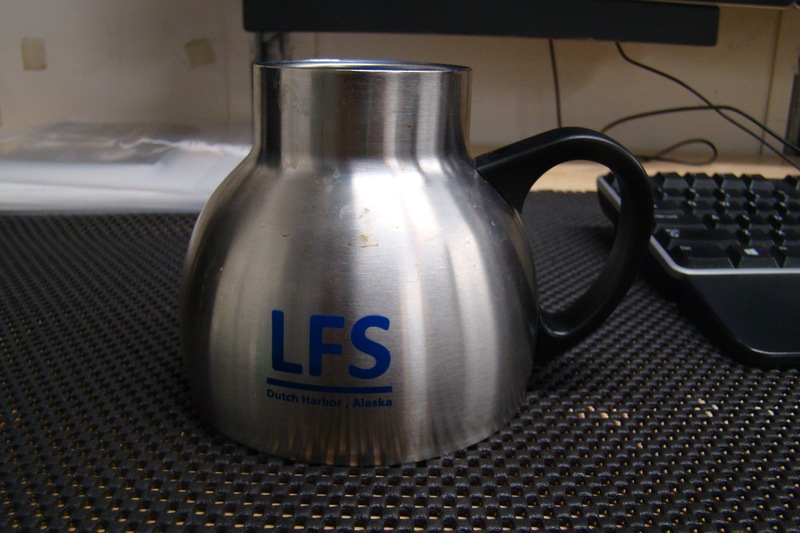 Why do you think this coffee mug is shaped like this (wider at the bottom than the top)? Ans. The wider bottom of the mug above prevents it from sliding as the ship rocks. Our bulletin board reminds us to secure for bad weather. This morning, I put small items in drawers, stowed books on shelves and packed my equipment (phone, laptop, camera, chargers and small items in a backpack that can be safely secured in my locker (the “closet” in my stateroom). *always hold on to railings with both hands when walking or going up steps. At all other times, remember to keep one hand for you (to do whatever you are doing) and one hand for the ship (to hold on). I also have been wearing patches to prevent seasickness. Hopefully they will continue to help. Only time will tell how we weather the storm (pun intended). Let’s hope it moves through quickly. I must begin by trying to convey how honored and excited I am to be a part of NOAA’s Teacher At Sea program. I will be sailing aboard NOAA Ship Oscar Dyson with another teacher, Lee Teevan. What an adventure! More importantly, it’s an opportunity to gain knowledge about the management of the Bering Sea Fishery, the commercial fishing industry and how these forces impact both the ocean ecosystem and our lives. It is an opportunity to educate my students and community about these factors and the career opportunities that support them. It also demonstrates the fact that, life long learning opportunities come in many forms. For the last five years I have been teaching at Lanphier High School in Springfield, Illinois. I look forward to bringing lessons into the classroom that can spark an interest in an unfamiliar aspect of scientific research and its real-life implications. Through these lessons, I also hope to expand student awareness of the related realm of job opportunities associated with this work. I graduated with a Bachelor’s degree in Biology and a concentration in Fishery Science. I earned my Teacher Certification in Biology and the Sciences. Following graduation, I chose a career in teaching. Through my education at the University of Wisconsin – Superior, I became interested in the Foreign Fishery Observer Program. I was a Foreign Fishery Observer on Japanese fishing ships that fished primarily for Arrowtooth Flounder in the Bering Sea. This involved sampling the catches, and determining how much of each species of fish were caught to guard against exceeding their assigned quota. I spent a month and a half aboard 3 different ships. The opportunity to work on NOAA Ship Oscar Dyson will allow me to learn about the Fisheries Management aspect of the Bering Sea. I returned to school to earn my Special Education Teaching Certification and earned a Master’s Degree in Educational Administration. As a teacher, I continued going to school and learning about many topics that supported my work. In order to increase my knowledge about Fishery Science, I took a class in which I created a teacher’s manual (An Aquatic Organisms Educational Module for the Therkildsen Field Station at the Emiquon Wetland Area on the Illinois River). This manual allows teachers to bring students to the field station, collect plankton samples and use the labs to study the results of their sampling. Students learn about the many aspects of the wetland ecosystem and even calculate estimates of the planktonic biomass of the wetland. How fun is that! I hope with my introduction, I peak your interest in this aspect of our world. I invite you to be a part of my experience in order to continue your life long learning journey as I continue mine.